What you need to know about the VW up! 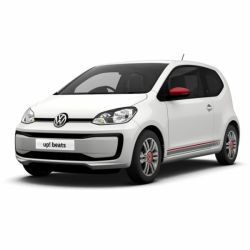 Volkswagen’s brilliant little city car, the VW up!, is surprisingly spacious and its well laid out cabin means you will never feel cramped inside. Available as both a three and five door the up! has space for four people and is available from the practical Take up! to the impressively equipped up! Beats. All models offer a fun ride with a range of optional extras so you can personalise your up! as little or as much as you desire.